#95 in Best of the 21st Century?, a series in which I view, for the first time, some of the most critically acclaimed films of the previous decade. Let me take a moment to clear up some misunderstandings about the “Best of the 21st Century?” title. The question mark is there for a reason; this is not my canon for the decade, but rather the collective critical canon as compiled by the website They Shoot Pictures Don’t They?. A talented critic named Kevin B. Lee started an exercise years ago in which he moved through the website’s all-time canon, watching and discussing the films he had not yet seen. His imaginative approach is to create video commentaries for each film – while my own work here is nowhere near as ambitious, I’m taking a similar approach, writing about each film on the 21st Century list that I haven’t seen. Key point: that I haven’t seen, so I have no way of knowing, going into a viewing right before a review, if I’ll like the movie in question. I’ve seen a few responses in the past saying something to the effect of “Can’t wait to see your other favorites” or “Do you really think this is one of the best of the whole decade?” Hopefully this introduction clarifies my approach. In Praise of Love contains two sections (many more if you want to put too fine a point on it, but two very distinct sections nonetheless). In the glacially-paced first, shot in a moody black-and-white, various characters reflect upon their lives and questions surrounding love, memory, and history. There is a filmmaker trying to make a documentary about love (or perhaps about Resistance heroine Simone Weill?) but his actions do not necessarily dictate everything we see; rather Godard seems to wander at will through Paris – this was his first film shot there in 35 years – and mourn the passing of the past. The tone of nostalgic reverie doesn’t quite suit the old master. Even in the “later period” films or fragments I’ve seen, there tends to be a restless flow to Godard’s images; yes, he has immersed himself in a classicism and scorned the Pop hagiography of his past, but he still seems to be at his best when suffering from an uber-cinematic ADD. The “elegance” of Praise’s first half then feels rather empty, as if Godard is trying to settle down and strike a Bressonian tone (the recently deceased filmmaker’s “Notes on a Cinematograph” are quoted later in Praise). But he can’t do Bresson any more than Bresson could have done Godard. Initially I found these scenes pleasant enough, but eventually they grew tiresome; affecting an elegiac, leisurely sensibility, they were unable to truly embody it. The second half – which begins with a title setting it two years before the first half - begins far more promisingly. The cuts accelerate and Godard dips the visuals in bleary video colorization which discards the forced romanticism of the black-and-white “present.” This, excuse the expression, breathless and impatient aesthetic conveys a desire to seize life by the throat and drink its blood vampirically; this is Godard’s forte and while most critics seem to have preferred the monochrome photography of the first half, I much preferred the look of the second. Unfortunately, the film doesn't lose its other problem: the ideas on display. Much has been made of the film’s anti-Americanism, but in truth it’s far too silly to be offensive (the actor playing the State Department official who “calls the shots in Hollywood, of course” looks like he’s inwardly counting down the seconds until he can get his paycheck and fly home). A young woman, hidden like Yoko Ono behind a veil of long hair, constantly interrupts the dialogue – mostly revolving around Steven Spielberg’s attempt to “steal” the memories of Resistance fighters – to remind us that Americans (er, North Americans, er, North Americans living in states, er North Americans living in united states, er North Americans living in united states that are located between Mexico and Canada…) have no name, and no history. Yet as the film winds down to a close, Godard catches fire and the movie burns up in a glorious conflagration before our eyes. Praise's first truly emotionally effective scene in the movie occurs when we finally see the long-haired woman’s face; revealed, she asks her mother why the family name was changed from Samuel. The older woman does not respond, she seems addled by senility, and suddenly all Godard’s ramblings about memory find their powerful articulation in this woman’s expression. 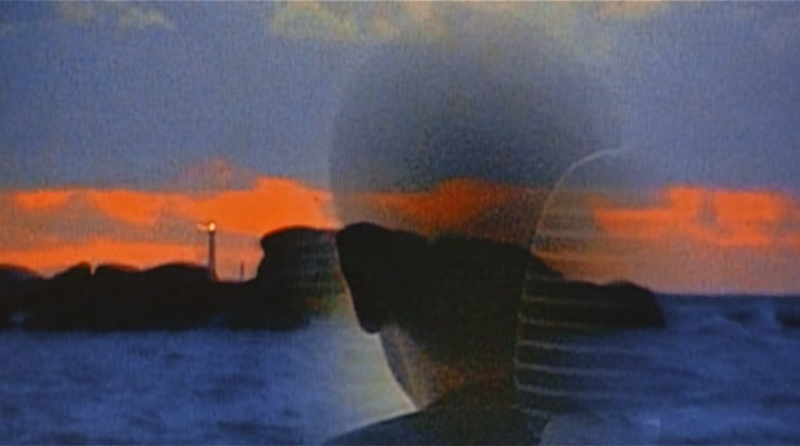 Then the visuals themselves begin to dissolve and bleed into one another, as if Godard is furiously scratching away the surface of the movie – and till now it’s been almost entirely surface – and revealing the palpitating heart underneath. Seascapes create a chiaroscuro affect around floating heads, waves wash over men getting into cars, a view out of a blurry windshield becomes a kind of heavenly visitation, the glowing orbs of headlights now angels come down to kiss our screens. Having knocked the film, I’d nonetheless tell you to seek it out if only for this rapturous finale. Perhaps it could be seen as a transition out of Praise’s mode and into the style of Notre Musique’s electric opening. The opening of Musique is the only part of that film I've seen, but it’s coming up in this countdown and if all of Notre Musique contains this kind of dizzying power and aching beauty, I look forward to it. At any rate, it will be a relief after the disappointment of Praise.